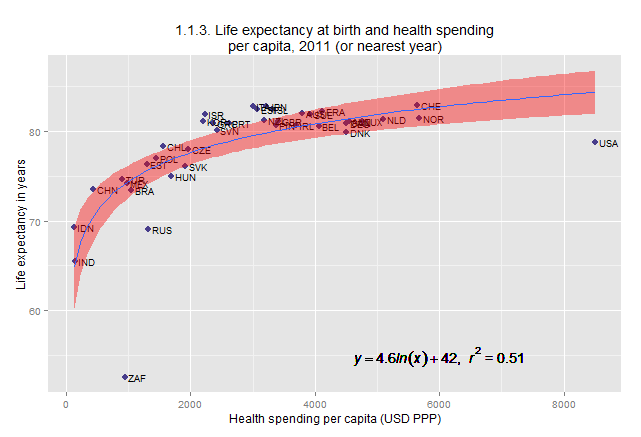 When @Conrad Hackett tweeted an OECD graph of life expectancy at birth vs. health spending per capita I wondered how hard would it be for me to reproduce the same graph in R using the same data. Here is my version with the addition of confidence bands and the equation on the chart. If look at the chart we can see that Denmark(DNK) achieved the same life expectancy result for about $4000 less person. Considering how much we are spending we should be getting life expectancy similar to Italy or Japan.